Image offshore software development services are intended to serve businesses that are software outsourcing development and programming to India. By judicious blend of Business analysis & Management with latest technology, Image develops state-of-the-art and custom software & web based applications. Image solutions enable reduction in the time and resources spent for a business process to take place for the clients, and serve to eliminate functional bottlenecks. Often, a manual process, albeit "visible", is not sufficient in a competitive environment and may result in hidden TCOs. By migrating a manual process to an IT-enabled one, the overall costs of executing a business process becomes much more rapid and cost-efficient. The initial costs of developing custom software solutions or offshore application development very quickly start to bear fruit as organizations find themselves in a position to ascertain the progress that they're making in terms of time-gains, resource-optimizations & cost-efficiency. Image offshore IT outsourcing services can enable you to attain your business goals and objectives faster. We offer complete end-to-end and cost-effective offshore software development solutions in the most advanced Internet projects including web application and design to customers from the small and medium enterprise. 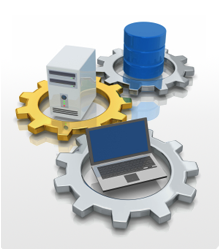 We are able to take care of offshore IT projects from A-Z. We analyze a project and define its goals, and plan a detail roadmap to achieve those goals. By following a rigorous and proven methodology of defining, designing and developing software projects, we turn project concepts into reality. With Image as your software Outsourcing Partner, you can reap benefits of Offshore IT Outsourcing & “best-in-class" offshore application and software outsourcing services in India.